Though the compact fluorescent lamp, commonly known as a CFL, is rapidly being replaced by LED technology, the CFL remains an easy way to bring energy efficiency to your home. In this article, we’ll give a brief breakdown of how CFL bulbs operate, where you can use them in your home, and how you should properly dispose of them. A quick survey of the home lighting landscape proves just how fast technology marches forward. Over time, we have learned that there are certain drawbacks and limitations when using standard incandescent bulbs, opening the door for newer, more efficient, and longer-lasting light bulb designs. One of the most popular of these is the compact fluorescent lamp. First unveiled at the 1939 New York World’s Fair, this bulb moves beyond traditional construction and reconceptualizes how home lighting can work. And today, the CFL boasts far greater energy efficiency than its wire-burning cousin, emitting much more light per watt of energy and far less heat to boot. But how? CFL vs. Incandescent: What’s the Difference? In many ways, the biggest difference between standard bulbs and CFLs comes down to how they produce light. However, this has far-reaching effects that affect bulb life, energy use, and more. Incandescent bulbs create light by passing electric current through a small wire, or filament. The electrical resistance of the filament causes it to heat up and glow. The catch is, only about 10% of the electricity used in this process is emitted as light. The other 90% is given off as heat. While this heat can be desirable in certain applications (heating lamps and botanical grow lamps, for example), it is usually just a wasteful byproduct of incandescent inefficiency. On the other hand, CFL bulbs contain a mix of gases that are held in a tube. Instead of a wire filament, electric current is driven through this tube to create ultraviolet (UV) light. Since we can’t see UV light, a special phosphor coating is applied to the glass to convert it to visible illumination we can see. So why is this innovative process important? Since the CFL does not rely on heat to produce its light, it is far more energy efficient than standard bulbs. Plus, different phosphor coatings can be applied to CFLs to customize the quality of the light output. Efficiency: CFL type bulbs use about 1/4 of the energy of a comparable incandescent bulb offering similar visible light output. Longevity: Lasting up to 10 times longer than a regular light bulb, a CFL can save you lots of annoying bulb changes and burned fingers. Expense: A CFL bulb does have a higher initial cost than an incandescent bulb. But it’s a case of the tortoise winning the race; over the lifetime of a CFL bulb it will save enough energy to pay for itself 10 times over. Quality of Light: Gone are the days of flickering, humming fluorescents giving off a creepy pale glow. Nowadays, CFL light bulbs are capable of producing quality light that rivals the best incandescent bulbs. Versatility: Coming in all shapes and sizes, CFL bulbs can be used almost anywhere you would use a regular incandescent bulb. Table lamps, ceiling fixtures, torchiere floor lamps, wall sconces, outdoor lighting, track lighting, recessed fixtures, and more can benefit from CFL technology. Pollution: Since most of our electricity comes from coal-burning plants, using a CFL reduces air and water pollution. Replacing just one incandescent bulb with a CFL can keep 1/2 ton of CO2 out of our atmosphere over the CFL bulb’s lifetime. What About the Warm-Up Time? In order to precisely control the electricity that travels through the gas inside the bulb, CFLs use a device called a ballast. In the past, fluorescent lights have been associated with flickering, humming, and slow starting. (Think about large gymnasium lights, for example.) This was largely due to the use of older, now outdated, electromagnetic ballasts. Today, this issue is no longer a problem. CFL bulbs use advanced electronic ballasts which do not tend to produce these performance anomalies. Today, this issue is no longer a problem. Modern CFL bulbs use advanced electronic ballasts which do not tend to produce these performance anomalies. Advancements in technology have dramatically reduced warm-up time, and the new ballasts are capable of regulating the electric current to product steady, reliable light. Once lit, these bulbs use about 70% less energy than incandescent bulbs. So, as you can, CFLs are a brilliant alternative to standard bulbs that make it possible for you to reduce your energy usage without compromising great home lighting. 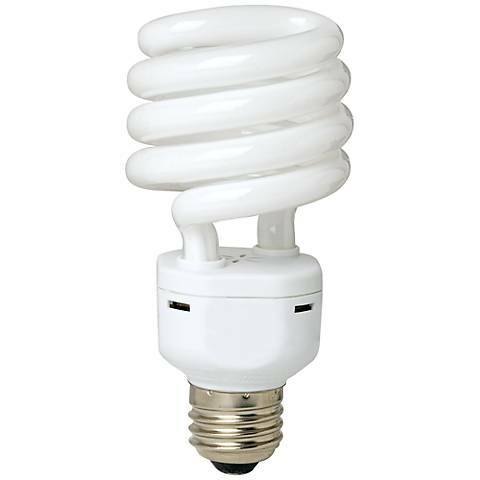 CFLs contain trace amounts on mercury that require a dash of extra consideration when getting rid of your old bulbs. According to the US Environmental Protection Agency, the proper use of CFL bulbs actually reduces the amount of mercury emissions because of their significant energy savings. When these efficient lighting solutions are implemented, the need for electricity is cut down, which means your bulbs last longer and power plants are forced to burn less coal (a major culprit in mercury emissions). As we noted above, the amount of mercury in a CFL bulb is pretty minimal. To compare, CFLs contain about four milligrams on average (barely enough to cover the tip of a ballpoint pin), while an older thermometer holds about 500 milligrams. No mercury is released when a CFL bulb is in use, and, as technology improves, this amount continues to decrease rapidly. In order to protect the environment, the EPA recommends recycling old bulbs through your waste collection agency and/or local hardware supply store. Contact them to see if they offer a disposal program, or to learn if your state has additional policies that require recycling instead of disposal. Now, sit back and enjoy your energy savings!